Beginners are warmly welcomed. No partner necessary. Refreshments available. The Dylan Perrillo Orchestra hails from Albany, NY a big band danceable jazz concert, music from the 1920's to modern compositions. Doors open at 7:00, music at 7:30, refreshments available. Room for dancing and for watching at this concert. Advance ticket discount ends at 4PM, day of the concert. Sheffield Contra Dances take place from 8:00 pm to 11:00 pm, with a lesson for beginners at 7:30 pm. There is a suggested donation at the door of $10-15 per adult and $8 per student, with a maximum of $25 for a family. All are welcome, regardless of age or ability. No partner necessary. Doors open at 7, Concert starts at 7:30. Advance tickets $20, Tickets at the door: $25. Refreshments available. Jerron "Blind Boy" Paxton and Dennis Lichtman have a reputation for transporting audiences back to the 1920's and making them wish they could stay there for good. They deliver blues, old-timey jazz, banjo rags, and Tin Pan Alley songs in a style drawing predominantly from pre-WWII. The two internationally-renowned artists are longtime friends, but this is their first run of shows as a duo. Dewey Hall's Spring Gala is Saturday, May 11th from 6-9 pm. Guests will be welcomed with local beer, wine and hors d'oeuvres. Dinner is catered by the talented culinary students of Sue Petrucci at Mount Everett High School. Following dinner is music by the local hot jazz band, The Lucky 5. Throughout the event, a silent auction will be featured in the library adjacent to the hall featuring unique local wares from around Berkshire County. Eat, drink, dance, and support this historic hall and all of our community events! Tickets are $50, groups can purchase a table for $45 a person. Tickets available through Eventbrite and can be purchased at the door! Come join us for a night of LEGENDARY tunes from Patsy Cline, Connie Francis, Carly Simon and Stevie Nicks! Doors open at 1:30pm & 7pm for complimentary beverages and refreshments. The reading begins at 2pm & 7:30pm, with a discussion to follow. Swing Dance at Dewey Hall w/ ch'CHUNK! Doors open at 7:30. Lesson at 8:00 with Vance Catapang, live music starts at 9:00. No partner necessary. Refreshments available. Beginners welcome. Doors open at 7, Concert starts at 7:30. Advance tickets $20, Tickets at the door: $25. Refreshments available. Enjoy dinner before the concert at the Stagecoach Tavern (https://rblodge.com/thestagecoachtavern/) at Race Brook Lodge and get 10% off (day of event only) w/ #OldtoneNative coupon code. An evening of live music and dancing to celebrate the holiday season in historic Dewey Hall. Calling by Jon Greene and the Contra Caller's Circus. Featuring music by Bethany Waickman, Dave Langford, Glen Loper, aka "Stomp Rocket." All dances are taught. Beginners & advanced dancers are welcome! Swing Night at Dewey Hall with the Twangbusters!! Doors open at 7:00. Lesson at 7:30 with Harry Pisila, live music starts at 8:30. Sliding fee scale $15-$20, with student ID: $10. No partner necessary. Refreshments available. We are saying Farewell to our fearless leader, Todd, and welcoming our new manager, Aretha! Come join us for food and drink and learn more about what Dewey Hall has to offer!! Join us for an ongoing tradition as Dewey Hall as partners with Music In Common to present FODfest, the annual concert commemorating the life of Daniel Pearl. This event is free & open to all. BYOB welcomed. Musicians interested in performing must register online at http://www.musicincommon.org/request-to-perform.html. Join renowned artists Moors & McCumber for an inspiring workshop and concert. Workshop starts at 3 pm, concert begins at 8 pm. $30- combination ticket $20- single event ticket Tickets available online at Eventbrite or at the door! Doors open at 7:00. Lesson at 7:30 with Jason Fenton, live music starts at 8:30. Oldtone Productions brings you another concert by Cocek! Brass band, music guaranteed to stir your soul. Doors open at 7:00, Concert starts at 7:30. Refreshments available. Balkan Dance lesson with Rose Tannenbaum will open the second set. We are elated to welcome back Runa to our majestic Hall. Runa fuses Irish folk, roots, and Americana music and simply put sounds like nobody else. Don't miss this rare opportunity to see this world renowned band in our warm and intimate Hall. Tickets are $15 and available at the door only. Doors open at 7:30 for the 8PM show. Refreshments available. 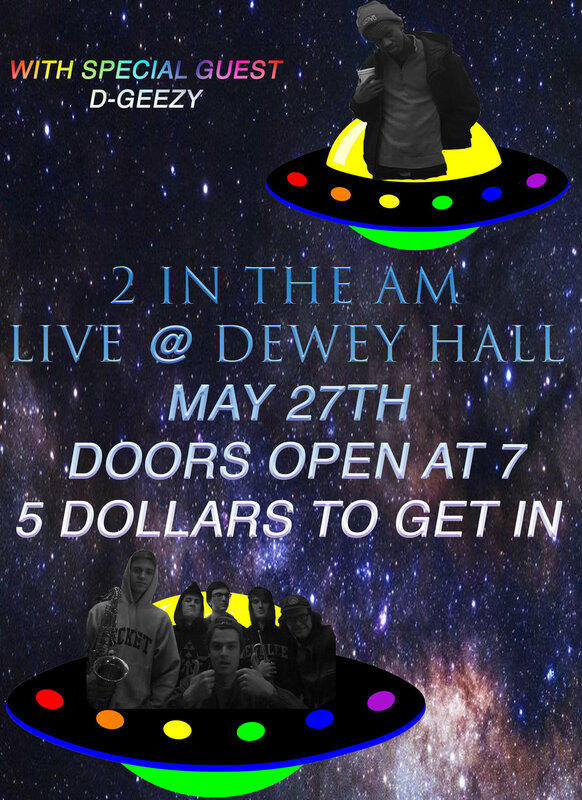 Dewey Hall is pleased to welcome back 2 in the AM, a high-powered rock, soul, funk band complete with horns and comprised of Monument Mountain High School and Berkshire School students. The band played to a packed house last month and the place was jumping. Special guest youth rapper D-Geezey opens the show. What could be better than the music of Led Zeppelin in the awesome wood-soaked tones of Dewey Hall. Featuring Berkshire all-stars Tom Major on drums, Rob Sanzone on guitar, Chris Merenda on vocals, and Jon Suters on bass, this show is not to be missed! Doors open at 7:30 for the 8PM show. Tickets are $10 for students and $15 for adults available at the door only. For $5 off your ticket price at the door, bring a dinner receipt from the Stagecoach tavern dated 3/23/2018. Beginners are warmly welcomed. No partner necessary. $20-15 at the door, $10 with student ID. 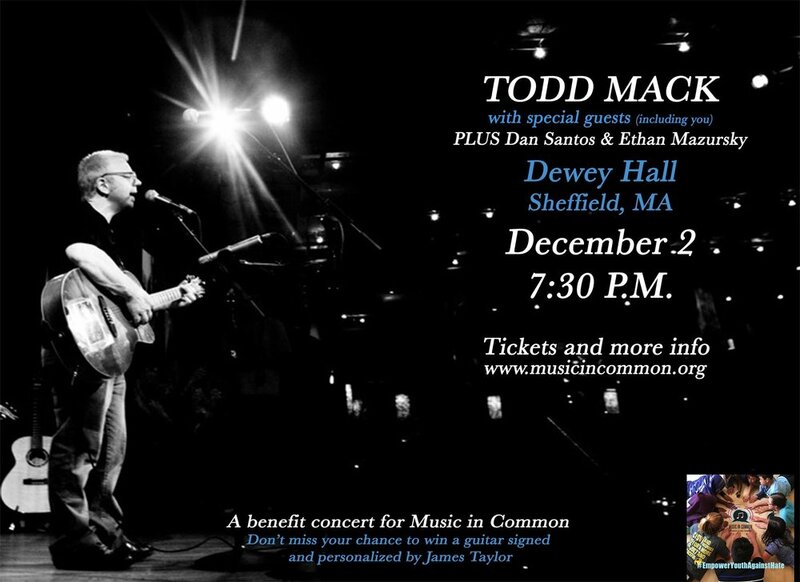 Singer-songwriter / producer Todd Mack will play a benefit concert for Music in Common, the non-profit he founded in 2005 in response to the murder of his friend and bandmate, Daniel Pearl. Music in Common empowers diverse cultures and faiths to discover common ground through collaborative songwriting, multimedia, and performance. For more than 30 years, Mack has made a career as a musician, songwriter, and producer based upon his unwavering belief in the power of music to change the world. His travels throughout the world have found him in some unlikely places to be making music, but always with the single mission of bringing people together. 100% of the profits from this show will be donated to Music in Common's #EmpowerYouthAgainstHate campaign to raise $159,000 from a federal grant that was recently revoked by the Trump administration. EDJ, featuring Momument Mountain High School students Dan Santos, Ethan Mazursky, and John Mack, will open the show. It's not every day that a band celebrates 50 years since they started playing together, but that's exactly what The Universal Set is celebrating. 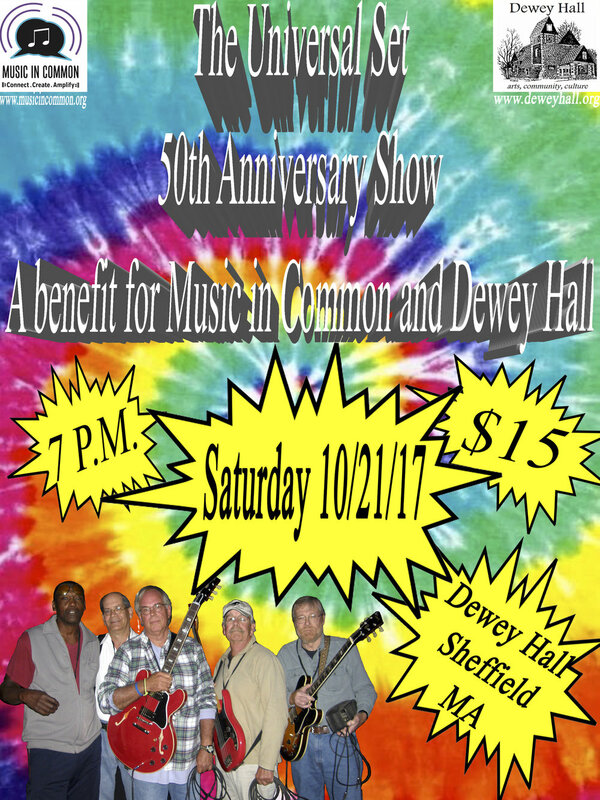 And what better way to do it than with a benefit concert for Music in Common and our beloved Dewey Hall. 100% of the profits from profits from the evening will be split between the two organizations. The Universal Set formed in 1967 here in the Berkshires and was a popular band throughout the greater MA-CT-NY region. In 1970, they recorded a record, landing them a recording contract offer they ultimately declined. The current lineup includes most of the original members, which at one time included the not yet famed Kenny Aronoff on drums. Come to dance or just enjoy the night in a beautiful hall with some great music, a snack, and a drink.